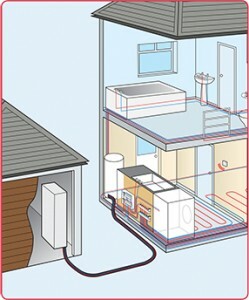 Flextra pipe is ideal for minimising heat loss in point to point heating applications, such as connecting a property to an external renewable heat source located in an outhouse – as can be seen in the example below which uses a heat pump to supply heating water to a thermal store inside the house. Flextra is available in long lengths (supplied to suit the site requirements), and the improved flexibility of the pipe makes for easy installation and minimises the need for joints. Typically the pipe can be installed in one uninterrupted length from the heat source to the building, eliminating intermediate joints entirely – thus minimising installation and system costs. In addition to pre-insulated pipe (also known as district heating pipe) the Flextra system includes a full range of accessories such as brass fittings and connectors. The wide range of products available for Flextra makes the system perfect for use in larger scale installations such as community or district heating projects, which will typically have a central heat source (such as a biomass plant) supplying multiple buildings on the site. 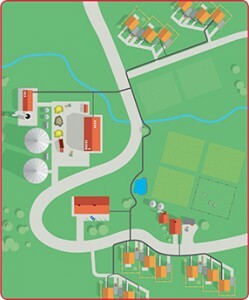 District heating projects will tend to have several pipe branches and multiple underground joints featured in the design – as illustrated in the example below. Maincor’s range of fittings are perfect for joining Flextra Pipes whilst enabling the low heat loss performance of the system to be maintained across the project.